To enter the MicroGeneration Awards you need to prepare your submission paper, complete the online entry form and upload your paper. Submitting your entry will then lead you to payment page to cover the entry fee. Individual and team entries in the People categories are FREE. 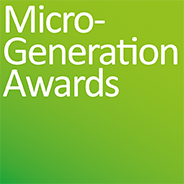 Entries into the MicroGeneration Awards must be submitted online. Your written entry must be no more than 1,500 words in English (12 point type, single line spacing) saved in PDF format (10MB maximum file size), uploaded from your desktop to the MicroGeneration Awards‘ website, when asked by the Entry Form. All entries should be uploaded following the template sections listed below. The Judges will automatically mark lower any entries exceeding the word count. At the same time, the judges will appreciate the conciseness of an entry. There is no need to use the full word count. Please adhere to these basic rules of entry, together with any other specific criteria described below. Photographs and video material may be made available for the judges to view, either upload these through the online entry form at time of submission or upload them to YouTube or Vimeo. You will need to include in your submission a link to YouTube or Vimeo, where the judges can look at any additional visual material. Do not upload a photo file larger than 5MB with your entry form as it will be rejected. Thumbnail images of illustrative material can be embedded in your written submission, if they help the judges understand your entry, but the judges will want to see larger reference images – one of which must be uploaded with your entry form. The closing date for entries is March 31, 2020, and you will need to pay the entry fee before your entry will be processed for judging. If you are planning to make multiple entries, please let us know in advance and we will arrange to bill you for all your entries on one invoice, to save you paying each time you upload an entry. Remember, nominations for individuals or teams in the People categories are FREE. Within your submission it is preferred if you use the following as sub-headings under which you clearly provide your explanation for the judges. Outcome, including formal evaluation of results, ROI, etc, or the take up by the public/customers, all to provide a measure of effectiveness (or for individuals and teams, their effectiveness in achieving targets or meeting strategic aims). Entries for the Micro-Generation Awards can only be submitted online. If you are entering on behalf of a customer, please make sure the customer is aware and approves of your entry. If you wish to provide additional support material (for instance if there has been marketing collateral or video work associated with your project, initiative, product or service) please provide a link to YouTube or Vimeo, where the judges can view your material. The judges will want to feel fully informed about your activity, so please include whatever you feel is appropriate and relevant for your entry. If an entry is entered into more than one category, please indicate this clearly, but remember you need to remind the judges of the micro site URL for the support material, each time you enter. So, it is important that you include as many visuals as you can to illustrate the contents of your entry. The judges don’t want massive photos, but they’d rather have that than small postcard-sized images that are too small to be useful. Bottom line: making it easy for our judging panel to see and understand what you did will only help. Relying on tiny thumbnail images in your written summary is helpful, but not the best idea. Always provide the full size images, too. The Micro-Generation Awards are UK-wide business awards. The organizers intend that the competition is open to the whole micro-generation sector, but any website that breaks national or international laws or offends public, religious, national or gender-specific sensitivities, or that flouts advertising, promotion or Internet rules (such as spamming) will be disqualified. If an entry is disqualified for any reason the entry fees will not be refunded.